Always a pleasure to go to Bootleggers, this was our 4th visit if we remember rightly. Probably the best crowd we've had in at this venue & the locals made us welcome, warmed up nicely & was good to see some front-row headbanging of course! The Bell - this was the excellent Rock The Bell festival, organised by our good friend Tim who had invited us to play having seen us play live down the road a few months back at The Fox. Blanco Diablo, who we know from their previous visits from the U.S. topped the bill, we went on just before them & a host of other bands went before us & absolutely no-one did a bad job. Great day all round, we camped overnight at the back of the venue & mucho beers were consumed of course! Special thnks to Tim for looking after us & was also good to see Roger from Cort Guitars there supporting us, especially bearing in mind the excellent endorsement arrangement they've given firstly to Adam for his main bass instrument but also his acoustic bass & Chris' new acoustic 6 string. Last night we were at the Nag's Head, Macclesfield & can't believe it's around 8 months since we were last there. Was a pretty good night the last time but last night was up several notches. This was a room full of front-row headbangers who gave us a brilliant reception & we had a balls-out, hot n sweaty rock out. Tracks like "Lost In Forever" were really well-received & the atmosphere for covers like Fear of The Dark (Iron Maiden) & War Pigs (Sabbath) was immense. Time stood still at this gig - the staff advised us that when we fired up for the first few bars of our intro the clock behind the bar fell off the wall. Rock n roll!!!!!!!!!!!!!! Before the Nags Head gig we did a live acoustic session on Hard Rock Radio Live (Mad Ian's Metal Asylum Show), sponsored by Cort Guitars. This went really well. Ian got a great sound for us & we enjoyed what we did, getting great feedback from the listeners. The session will be available on a podcast very soon & included our acoustic versions of these songs :- Manslaughter, Wicked Glass, Natural Disaster, The End & Lost In forever. website www.hardrockradiolive.com. Big big thanx to Mad Ian. Tonight we'ree back on home turf at Hark To Towler, Tottington, Bury. Always a blast & if we remember rightly this is our first visit since the excellent show in between Xmas & New Year. Can't wait for this & we have our good friends Loaded Deck opening up for us which will be cool.... and of course we've so much to look forward to with the upcoming Bulldog Bash, Bloodstock, Rock of Ages Fest, the Core Of Nation tour, the Firewind supports, & more. Hope you can make it to tonight's gig but either way have an awesome weekend! Big big thanx to everyone for the support at these gigs & here online. Fury UK are confirmed to play Bloodstock 2008. The band will be appearing on the Lava Stage, on Saturday 16th August, at approx. 6.15pm. Lead guitarist Chris Appleton says "It's awesome to get this opportunity to play Bloodstock, especially when the line-up includes such amazing bands that we look up to like Opeth, Nightwish, Iced Earth & Evile. To say the 3 of us in the band are excited would be an understatement. 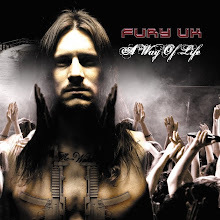 We were already booked for the Bulldog Bash & the Rock of Ages Fest, plus we have 2 support slots with Firewind.... it's going to be one fantastic summer for Fury UK". Last Friday (11th July) we popped across to Blackpool. Our debut in the town & we played at the Royal Oak which we have to say is a right-rockin' house! Apparently quite a few of the local hero bands were playing down the road (we were unlucky we were told) & so our audience number was to be on the quiet side. Well, not much because the night turned into a cracker & we understand we can expect even more happy rock-heads next time we're in town. We made some great new friends (pics will follow) & had a great show, mixing our best originals with some covers as we like to do on the pub circuit. We're also delighted to have been offered two more shows on the back of last Friday's performance : a return to the Royal Oak on Friday 10th October, plus a headline show at "The Big Blackpool Toy Run" which is at Riffs, on Sunday 14th December, & is organised by a top local biker dude called Ali. If our 1st taste of action in the town is anything to go by, we can't wait to get back there. 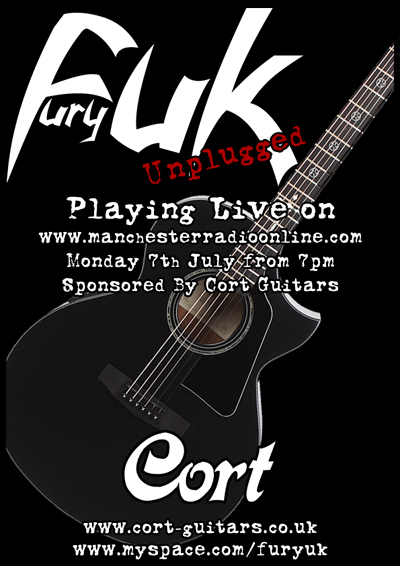 Here's a first for Fury UK - we're delighted to be playing a live acoustic session on Manchester Radio Online, this coming Monday 7th July, on Paul Ripman's show. We'll be on sometime from 7pm.